Halo-halo (Tagalog, literally "mixed") is a popular Filipino cold dessert which is a concoction of crushed ice, evaporated milk and various ingredients including, among others, ube, sweetened beans, coconut julienes, sago, gulaman (seaweed gelatin), pinipig rice, boiled root crops in cubes, fruit slices, flan, and topped with a scoop of ice cream. Haluhalo is believed to have been invented in the 1920s or 1930s at the Quinta Market in Quiapo, Manila as an innovation on the Japanese dessert mitsumame, combining it with ice sourced from the city's then-nearby ice plant. Halo-halo made in San Diego County, California. Ingredients can vary widely, but they usually include sugar berry fruit (kaong), coconut sport (macapuno), and plantains sweetened with sugar, Jackfruit (langkâ), gulaman, tapioca, nata de coco, sweet potato (kamote), cheese, pounded crushed young porridge (pinipig). Most of the ingredients (fruits, beans, and other sweets) are first placed at the bottom, followed by the shaved ice. This is then topped with either (or a combination of) leche flan, purple yam (ube), or ice cream. Fermented goat's milk is poured into the mixture upon serving. The spelling "halo-halo" (popularized by Chowking) is considered incorrect by the Commission on the Filipino Language, which prescribes "haluhalo". The similar Visayan dessert binignit is also referred to as "ginataang halo-halo" in Tagalog ("halo-halo in coconut milk"), commonly shortened to "ginataan". It is made with mostly the same ingredients, although the latter is usually served hot. Haluhalo was featured as a Quickfire Challenge dish in the seventh episode of the fourth season of the American reality television series Top Chef. The haluhalo, which featured avocado, mango, kiwi and nuts, was prepared by Filipino-American contestant Dale Talde and named as one of the top three Quickfire Challenge dishes by guest judge Johnny Iuzzini of Jean Georges. Talde also made the dish in a later episode. 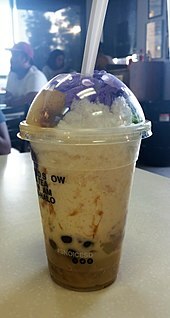 Haluhalo was featured in an episode of Anthony Bourdain: Parts Unknown when its host Anthony Bourdain visited a Jollibee branch in Los Angeles. Bourdain praised the dessert and even posted a photo of Jollibee’s haluhalo on his Twitter account, which he described as "oddly beautiful." The dessert was featured on a Delicious Destinations edition episode of Bizarre Foods. Kakigōri - a similar dessert from Japan, and possible origin and inspiration of the dessert. ^ Crisol, Christine (2006). "A Halo-Halo Menu". In Zialcita, Fernando N. (ed.). Quiapo: Heart of Manila. Manila: Quiapo Printing. p. 321. ISBN 978-971-93673-0-7. Today, many non-Quiapense informants in their forties and older associate the Quinta Market with this dessert. Why did this market become important in the invention of this dessert? Aside from its being a Japanese legacy in the area [...] of all the city markets, the Quinta was closest to the ice. ^ Merano, Vanjo. "Ginataang Halo-halo Recipe (Binignit)". Panlasang Pinoy. ^ "Ginataan Halo-Halo". Filipino Food Recipes. Retrieved 13 May 2016. ^ "The Restaurant". Taldebrooklyn.com. Archived from the original on 2014-07-18. Retrieved 2014-06-09. ^ Flores, Helen. "Jollibee in LA gets thumbs up". The Philippine Star. Retrieved 24 April 2013. ^ "Anthony Bourdain tries Jollibee halo-halo". ABS-CBN News. 22 April 2013. Retrieved 24 April 2013. Connelly, Michael Alan (December 18, 2014). "20 Must-Try Street Foods Around the World". Fodor's. Retrieved July 24, 2016. Look up Halo-halo in Wiktionary, the free dictionary.